“Living the Dream” today for Mark Limke as he made his First Solo! 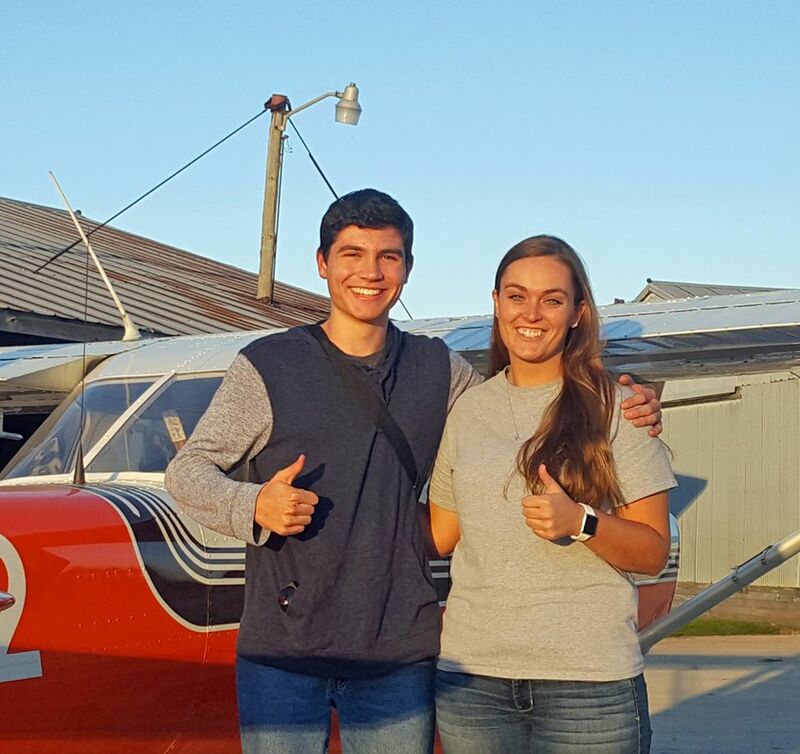 Pictured with his Instructor Nicki Ervin after flying our Cessna 152, N69042…quite an accomplishment…Click to read more about this amazing young man! Poplar Grove Airport is rapidly gaining a reputation for being the airport of choice for aviators in the greater Chicago and southern Wisconsin area. The reason is very simple. We've made a conscious decision to forgo the more traditional approach of trying to attract business aviation customers and focus on creating a fun, friendly, neighborhood atmosphere for people who are in aviation for the pure fun of it. When people fondly talk about the way flying and airports "used to be," they need look no further than Poplar Grove Airport to get that old familiar smile put back on their face. While we actively promote the fun atmosphere of the past, we haven't lost sight of the fact our customers expect a high level of modern services. Poplar Grove Airmotive, which shares common ownership with the airport, operates the airport and its various support services. We have a full service FBO with a friendly staff ready to handle your needs. We also have a modern, 20,000+ sq.ft. maintenance facility which includes an airframe shop, engine overhaul shop and accessory overhaul shop. Your first visit to our airport will show you that a modern facility teamed with good, "old fashioned" service is truly a winning combination. We are committed to the future of general aviation, and we help promote that future by operating an active flight school. Our flight school is comprised of 5 full-time, certified instructors and a fleet of well maintained rental aircraft that includes conventional Cessna 152 and 172 trainers, as well as a Piper J-3 Cub and Cessna 140 for those who prefer to learn in a "taildragger." The airport's main 4,000-foot hard-surface runway is complemented by two grass runways, both 2,500' long by 150' wide, which provide a safe environment for learning flying skills in the aircraft of your choice. Poplar Grove airport is the place to earn your wings. With pristine grass runways as well as the traditional asphalt runways Poplar Grove gives the student a well rounded aviation education experience. Our students learn from highly trained FAA Certified Flight Instructors. Choose from Tail wheel to Retractable Wheel aircraft. Come by the Grove and see the difference. Intro flight's start at $80 and are logable toward your license. Come fly with us! Take some time and look around our site. We have tried to make it just like the airport; friendly and fun. If you have any comments or suggestions, please feel free to e-mail us, give us a call, or use the method we like best: stop by and visit us in person!